The following text has been reprinted from The Archipelago of Hope by Gleb Raygorodetsky, published by Pegasus Books. A red dot streaking through the drab autumn landscape of sparse forest stands scattered over hills and valleys, surrounded by the lakes, wetlands, and streams—our small rental Ford heads northward to Sevettijärvi, the center of the Skolt Sámi Settlement Area in northern Finland. Tero Mustonen, the Director of Snowchange Cooperative, works with Indigenous communities around the world on climate change-related projects and is the one expertly piloting us northward. We stop for lunch at the roadside town of Kuusamo, just south of the Arctic Circle. Tero fills up the tank, and I wander through the gas station’s minimart hoping to spot a sign of the approaching Land of Reindeer. I am rewarded in the meat section, where I find poro (Finnish for reindeer)—row upon hanging row of sliced smoked sausage, and the freezer full of reindeer meat cuts and bones, among a few packs of frozen wild cloudberries and lingonberries. It is pork and pasta for lunch at the gas station cafeteria, but Tero lifts my spirits with a promise of the best of the Sámi Arctic cuisine we will sample at Porotila Toini Sanila, a small Skolt Sámi family-run hotel just outside of Sevettijärvi, where we will stay. Tero’s relationship with the Arctic and the Skolts goes back to his childhood fishing trips in Lapland. He remembers falling asleep in the tent, as his dad talked to the Skolts visiting their fishing camp late into the white Arctic summer nights. Tero grew up knowing that the Skolts were a very special people, because his father always spoke highly of the Skolts as very knowledgeable and skilled fishermen and reindeer herders. When he got older, he learned of their history and, eventually, found a way to develop a long-term working relationship with them as part of the Snowchange’s work. The Skolt Sámi are a small but culturally and linguistically distinct group of the Eastern Sámi. Historically, the Skolts’ traditional homeland spanned hundreds of miles over the vast area, from the shores of Lake Inari in the west to the Kola Bay in the east, and the present-day location of the Russian city of Murmansk. Of the seven hundred Skolt Sámi living in Finland today, two-thirds live in Sevettijärvi, located about three hundred miles above the Arctic Circle, where the two months of continuous summer sunlight follow the eight sunless weeks of winter. Though the village is located a mere forty miles away from the frigid Arctic Ocean, the warm Gulf Stream makes it one of the warmest areas of Northern Europe. Skolts are considered to be the most traditional Sámi reindeer herding and fishermen group because they retain their native language and continue to rely on a centuries-old customary governance system, a community council called Sääbbar in Skolt, that makes decisions about land use, fishing, and herding. Fishing used to be the Skolts’ main traditional livelihood, supplemented by hunting of wild animals, including wild reindeer. Small reindeer herds were kept for transportation, milk, and as decoys to lure wild reindeer to hunt. As wild reindeer stocks declined in the 19th century, Sámi began to gradually switch to reindeer herding but kept their fishing practice strong. In the old days, Skolt family groups would arrive at their autumn lake sites at the end of August to fish and gather reindeer. After the winter frost in October, families would move to their early winter sites along the rivers to go ice fishing, hunt ptarmigan, and trap for fur. By late December to early January, everybody would gather at their winter villages to spend the coldest time of the year socializing and getting ready for the next fishing season. Skolts would spend the reindeer calving period, between April and May, looking after their herds, before setting them free until the fall. Summers were spent on family lakes fishing for salmon. And the annual cycle would be repeated. Despite multiple social and environmental changes, says Tero, many elements of this perennial ritual continue to be practiced by the Skolts. “Adapting to change is nothing new to the Skolts,” Tero explains. “They’ve gone through dramatic shifts many times in their history.” The Skolt Sámi story is one of resilience and adaptation, as they have maintained the core of their traditional relationship with the land in the face of social and political upheavals. For centuries, the Skolts’ homeland has been in the middle of a power struggle between Russia, Denmark-Norway, and Finland. As national boundaries drifted east to west and back again, Skolts found their national allegiance shift from one nation to another, sometimes overnight. After Russia’s victory in the 1808–1809 Finnish War over Sweden, the Skolt traditional territory became part of Russia’s Duchy of Finland. A century later, after the Great October Revolution of 1917 dethroned the Russian Tsar, Finland became a sovereign state for the first time. As part of the Treaty of Tartu, signed between the Soviet Union and Finland in 1922, Russia ceded to Finland the region of Petsamo, including a portion of the Skolt traditional territory that gave Finland access to the Arctic Ocean. A mere two decades later, in 1939, the Soviet Union invaded Finland, with no provocation, during what became known as the Winter War—the prelude to World War II. When WWII ended in 1945, Finland was forced to surrender the entire territory of Petsamo, including the Skolt Sámi territory, back to the USSR. The Skolts were given a choice between staying on their traditional territory and becoming part of the Soviet Union, or leaving their homes for Finland. The Skolt families in the western part of the Skolt traditional territory went to Finland, which turned out to be a prudent choice, because few Skolts who stayed in the now-Soviet-controlled area survived collectivization, persecution, and gulags. Most of the Skolt refugees in Finland spent the first winter living near Lake Inari, in abandoned military barracks and cabins that were left after the war along the new border with the USSR. The Finnish government designated this area as the Skolt Sámi Settlement Area, to enable the refugees to continue their land-based traditions of reindeer herding and fishing. In the past, this area was home to the Näätämö Sámi who became fully assimilated into the mainstream society in the late 1800s. Tero Mustonen, head of the Snowchange Cooperative, paddles across Ylinen Lake, near his village of Selkie, Finland. By 1949, the Skolts moved into neat, red-painted, two-room cabins built by the Finnish government along the lakes and streams stretching from the northern shore of Lake Inari to the Norwegian border. A school, a health center, and a Russian Orthodox Church were built, forming the nucleus of the village of Sevettijärvi, named after the nearby lake. With the eventual enactment of the Skolt Settlement Act, the Finnish government allowed Skolts to herd their reindeer, gather hay and lichen for them, collect firewood, cut timber for buildings, and build fishing cabins. Though there are some similarities between the Skolt Sámi Settlement Area and their traditional homeland, there are also significant differences. The former is situated in the transition zone between the forest and treeless tundra, while the latter is located largely in the forested boreal zone. To survive here, the Skolts had to develop a new intimacy with the land, which was not easy. It took years for the Skolts to settle in the new ways, and to feel like the land accepted them, and that they had adjusted to a new way of living. “This history,” says Tero, “helps the Skolts today navigate the challenges of climate change,” as once again they must develop a new relationship with a changing land. In the summer of 2007, Snowchange received a call from its partners in Murmansk that two large Canadian mining companies—Barrick Gold and Puma Exploration—were gearing up to begin mining on the Skolt Sámi land in Russia. Immediately, Tero wrote to the International Sámi Council—a governing body representing Sámi of all four Nordic countries (Finland, Sweden, Norway, and Russia)—asking for help. Ms. Pauliina Feodoroff—the newly elected president of the Sámi Council at the time, and a Skolt Sámi herself—immediately responded. Soon, they were working together on a land-use study to demonstrate that the area where the mining operations were planned was not vacant but was, in fact, the traditional territory of the Skolt Sámi, who have lived there for centuries. With the little bit of the funds they managed to raise, Tero and Pauliina started cross-border exchanges between the Finnish Skolts and their distant Russian relatives, as part of the land-use documentation and mapping work based out of Sevettijärvi. “Snowchange’s work with the Skolts and other Sámi is very straightforward,” explains Tero. “It’s a peacemaking plan. We are trying to address the painful legacy of centuries of encroachment and assimilation by southern Finns on traditional Sámi territories. All the work that we are doing with Sámi is about this, be it a land-use mapping or climate change adaptation project. It is all about reconciliation,” he says. “If we can create and maintain a respectful relationship with the Sámi and return to them the land and rights they ought to have, we are also healing ourselves as a nation,” he concludes. This work led to the development and publication of the Eastern Sámi Atlas which, through photographs and maps, shows how and when different groups of Eastern Sámi, including the Skolts, used to live on their traditional territory. The volume was a communal effort at making the Skolts’ unseen histories visible. For their work on this project and the publication of the atlas, the Snowchange Cooperative—a Finnish organization—was recognized by the Skolt Sámi with the “Skolt of the Year Award” in 2011. The highway winds through the southern part of the region, where a mix of thin pine and birch forests carpets the rocky landscape. Farther north, pine trees are replaced by the stunted Arctic vegetation. The road snakes around lakes and streams—some fringed with dwarf birches and willows, others ringed only with mossy boulders. Five hours after crossing the Arctic Circle, we reach Lake Inari. This 400-square-mile body of water is large enough to support fifty commercial fishermen hauling in over three hundred tons of whitefish every year. The road takes us along the lake’s northern shore, at the southern edge of the Skolt Sámi Settlement Area, for about ten miles and continues northeast for another thirty miles until we reach the smaller Lake Sevettijärvi. We pass by the village’s center—the school, church, and Skolt administration offices cluster on a small promontory jutting out into the lake—and continue for another twenty minutes northeast, toward the Norwegian border. Finally, a small blue road sign with plain white lettering—Porotila Toini Sanila—directs us from the main highway toward our home away from home for the next few days. A small family guesthouse and a reindeer farm run by the Sanila family, the hotel sits on an isthmus separating Lakes Sevettijärvi and Kirakkajärvi. We pull up to a large unremarkable one-story building housing the office, kitchen, dining hall, a sauna, and several guest rooms. Greeting us at the door, Ms. Toini Sanila is glad to see Tero, who is her regular tenant during his visits to the community. A retired school principal, now in her sixties, Ms. Sanila still seems to hold on to her pedagogic habits, and, after giving him a hearty hug, jokingly chastises Tero, like a mischievous student, for being late. The frozen ground crunching under her boots, Ms. Sanila—a portly, yet spry, diminutive woman—immediately marches us off to our cabin. It is a brick-colored kota—a hexagonal traditional Sámi log cabin—one of several such guest huts scattered around the main hotel building, all surrounded by groves of stunted pine trees, water, and mossy boulders. As we unpack and get ready for the promised dinner, Tero tells me that since her retirement a few years ago, Ms. Sanila has been running the Porotila hotel with her grown daughters. Business has been reasonably good, with quite a few tourists coming here throughout the year to fish the area’s lakes and rivers and watch the northern lights in the winter. Our dinner is as delicious as Tero promised—a simple collection of hearty traditional dishes, including sliced cold-smoked salmon, dark rye bread, creamy salmon soup, and a reindeer stew with mashed potatoes and fried mushrooms, followed by a cloudberry cake. After we finish off the seconds, Ms. Sanila joins us for tea and a chat. A Finn herself, she married a Skolt reindeer herder and moved to Sevettijärvi in her youth. Now a respected Skolt elder, she has definitely lived through a few changes around Sevettijärvi. “The main difference,” she observes, “is that now there is less snow than before.” She recalls that when she had just moved here in her teens, there was at least three feet of snow every winter. Now everything is in flux—some winters have very little snow, and others have too much. Mid-winter temperatures are not as consistent as before, shifting from cold to warm and back again. Her family keeps some reindeer, so Ms. Sanila knows firsthand that predictable weather is a must for successful reindeer herding. Timely freeze-ups in early winter are essential for a herder to be able to travel over lakes and small rivers to gather his animals. 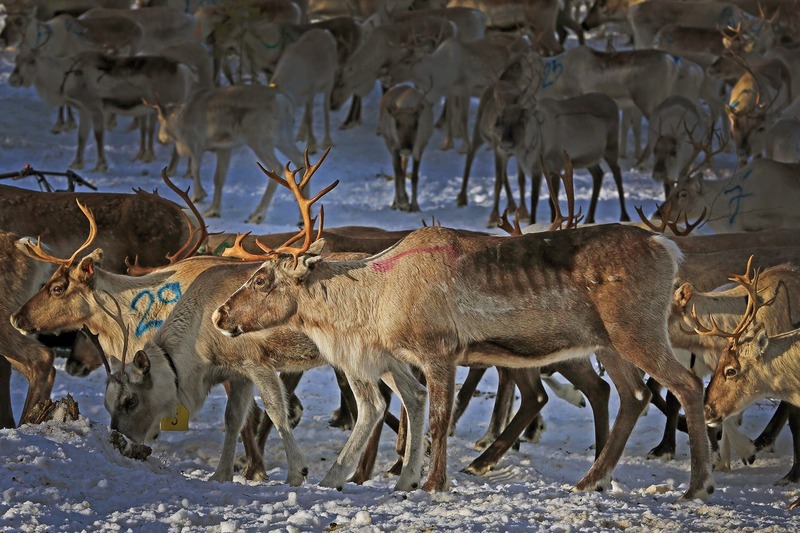 But, when the freeze-up comes late, traveling on skidoos along traditional reindeer migration routes becomes unsafe and reindeer roundups have to be postponed until later in the winter. By then, however, a lot of the fat the reindeer put on over the summer and early fall melts away and the quality of meat diminishes. As a hotel owner, Ms. Sanila has also noticed that, with the fall freeze-up coming later, and the spring thaw arriving earlier, the winter tourist season is getting shorter. When a couple of years ago there was an unusually warm spring, they lost about a third of their tourist income. “Why would anybody want to come here if they can’t ski or ride a skidoo?” she asks sarcastically. The summer weather has also been changing. It is a lot warmer now, compared to when she was young, she remarks. In the past, June and July weather was warm and wet and reindeer moved to higher windswept areas to escape mosquito swarms. Trying to hide from the bloodsucking menace, the animals would bunch up into herds, making it easier for the Skolt herders to round them up and push them to a corral for branding or vaccination. When the summer weather is hot and dry, as has been the case recently, mosquitoes are not as abundant, and gathering the reindeer into herds becomes more challenging. At the same time, mushrooms—an important seasonal reindeer food—do not grow in the dry soil, forcing the herders to once again look for extra feed for their animals. Despite all these seemingly insurmountable challenges, Ms. Sanila feels confident that the Skolt will find a way to adapt their livelihoods, culture, and even language, to the changing circumstances, be they climate change or whatever else life throws at them, just as they’ve done for hundreds of years. Gleb Raygorodetsky is a Research Affiliate with the Polis Project on Ecological Governance at the University of Victoria and the Executive Director of the Indigenous Knowledge, Community Monitoring and Citizen Science Branch of the Environmental Monitoring and Science Division, Government of Alberta. His book “The Archipelago of Hope” has been recognized by Library Journal as one of the Top10 Sci-Tech Nonfiction books of 2017.